Earlier today it was announced, by Teiken, that we'd have a show dubbed "World Premium Boxing 19 The REAL / double world title match" on April 23rd. The show, as the title may have given away, will feature two world title title bouts. 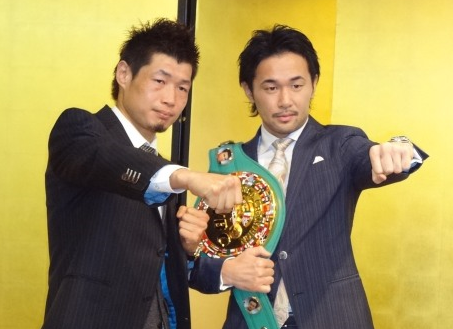 One of those will see former WBC Bantamweight and WBC Featherweight champion Hozumi Hasegawa (33-4, 15) challenging Spain's hard charging Kiko Martinez (30-4, 22) for the IBF Super Bantamweight title. This fight sees Hasegawa attempting to become just the second Japanese fighter in history to win world titles in 3 weights. At 33 years old Hasegawa will likely know this will be his only chance to claim a 3rd divisional weight title though will know he's in a tough contest as he takes on Martinez who is on a real role at the moment having stopped his last 3 opponents Damian David Marchiano, the then IBF champion Jhonatan Romero and former world champion Jeffrey Mathebula. For Martinez this will be his first fight in Japan and his first bout against a Japanese fighter. For Hasegawa it will be his first fight against a European opponent since he faced Simone Maludrottu back in 2008 and his first world title fight since losing to Jhonny Gonzalez back in April 2011. This bout is almost certainly going to be great for as long as it lasts. Hasegawa, whilst not the most durable, will likely fight fire with fire an this could end up being a barn burner. The second world title fight will see current WBC Bantamweight champion Shinsuke Yamanaka (20-0-2, 15) defending his belt for the 6th time. Yamanaka, like Hasegawa, will be facing a European opponent in the form of former European champion Stephane Jamoye (25-4, 15) who is an exciting all action fighter. Yamanaka, to many the man to beat at Bantamweight, will likely be making one of the last defenses of his titles before he moves to Super Bantamweight himself. This will be a bout where he will attempt to use the new tools he has learned whilst in a US training camp, including a tweaked right hook that many feel will help him if, and when, he moves up a division. For Jamoye, who actually lost his European title last time out to Karim Guerfi, this will be his first world title fight. Despite that he has shared the ring with a list of top fighters including former WBO Bantamweight champion Pungluang Sor Singyu, current WBO Bantamweight champion Tomoki Kameda, former IBF Bantamweight champion Jamie McDonnell and current WBC Super Bantamweight champion Leo Santa Cruz. Of those men only Santa Cruz managed to record a decisive victory over him, stopping him in 6 rounds with a vicious body shot. We believe that this will be Yamanaka's first contest with a European opponent and, as with the other contests, it promises to be a thriller with styles we can just see gelling perfectly. One other fighter announced for this card is Takahiro Ao (25-3-1, 12) though his opponent is yet to be named. This show is set to take place in the wonderful Castle Hall in Osaka. The venue can accommodate up to 16,000 people for sporting events and we wouldn't be shocked to see it sell out given the quality of the two main events. Unfortunately we believe this will be televised on pay TV channel WOWOW and may be difficult for international fans to see live unless an international channel picks it up. We encourage you all to get in touch with your local TV channels (including HBO, Showtime, AWE and Boxnation) and request that they put this on as you could all end up missing what looks like a great card.